The student flats and houses in Heaton is perfect for students to live and one of the most affordable areas to stay in as a student in Newcastle. Our Student houses in Heaton and student flats in Heaton are close to lots of great parks, coffee shops and restaurants. Chillingham road is where you will find most of what goes on in Heaton, with its restaurants, coffee shops, bars and takeaways. It also has a lot of green spaces like Heaton Park which leads onto further parks and walks in Jesmond. It has a varied range of accommodation to suit students or professionals from large Victorian houses to trendy 2 bed apartments. Rents here are less than student flats in Jesmond and student flats in Sandyford making it an ideal place to live for those on a budget. 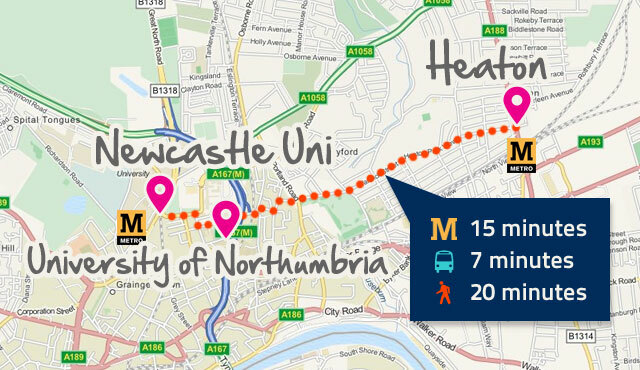 Getting into the city centre or University is easy from Heaton with plenty of buses and its own Metro station. The No1 bus runs through here every 10 minutes or you can walk in about 15 minutes. Positioned on the corner leading up from Jesmond to Heaton, this place is highly spacious and has a decent size beer garden. You may be surprised to know it also comes complete with relaxing conservatories. It has an excellent reputation for live music (mainly jazz, both national and international). The Chilli is a pleasant place to have a few pints, which, while roomy can still get jam packed. There are two pool tables and the occasional live band, a popular starting point for your big night out. For mouth-watering Indian food you have got to pay Solomans a visit. It’s located at the very top of Chillingham Rd, well worth the walk! Also Indian food Khans on Heaton Rd is a good place to spend an evening. Don’t forget to take your favourite tipple along as this restaurant does not offer any alcoholic drinks. If you don’t want to bust the budget try Sambuca’s, located inside Heaton Park, you must be prepared to wait as it does get fairly busy especially at lunch times and Sundays. For a quick take-away pizza you can go to Dominos or Pizza Hut. Located on Heaton Rd, try this place for fantastic Vegetarian food. You can also have breakfast here and it is also open for Sunday lunches! To summarise Heaton has lots to offer to both students and professionals with its numerous pubs, bars, delis and restaurants and great transport links into the city centre. It also has a great selection of accommodation to rent. If you can’t find it on Chillingham rd then its not worth finding. Contact us now to find your next house and we can pick you up from anywhere in Heaton and show you around our great selection of student or professional accommodation.